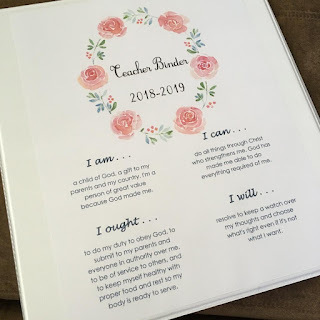 If you are anything like me, organization does NOT come easily for you (which you might remember me sharing in my homeschool organizational video here)...and I am sending so many virtual hugs to you for the struggles that must come from that reality! Ha! Because of my lack or organizing genius, I could not come up with a way to store my timeline cards outside of just piling the whole stack into a drawer and then rifling through them every single week when I needed to change our memory work display. While that "system" technically worked, it was not fun! 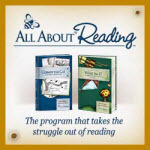 Enter, life-saving homeschooling mama on the Classical Conversations Offical Facebook Page! Someone reached out asking for ideas about this topic, and a super-smart mama showed off her system that contained all of her cards neatly organized and labeled by week. I was in love! The fact that her system had a lid sealed the deal (tee hee...the lid "sealed" the deal!!) because when you have a curious toddler, every layer between said toddler and disaster is a bonus! This setup could not be easier, and the best part? It only cost me $7.01 to create! 1.) You will need a Sterilite EZ Carry Storage Container w/Lid (9 and 1/2" L x 8" W x 6 and 7/8" H) as the storage container for this project. I found mine at Wal-Mart for only $3.47! This is the perfect size for storing all 24 weeks worth of cards, and is especially great for tutors, as the lid has a handle that makes it super easy to carry! 2.) Prepare your labels. I chose to use Avery 2-Sided Writable, Smudge-Free Mini UltraTabs (40 per pack), and a Sharpie Ultra Fine-Point Marker. THIS IS IMPORTANT! These are the only pens I have found that do not smudge or bleed when writing on divider tabs! You will simply number your chosen labels with the numbers 1-24. 3.) Divide your cards by week, and insert each week into the container one at a time, placing the corresponding week's label to the first card in every week. I love these dividers because they are re-positionable, which means you can remove and re-stick them to your surface a few times before they need to be replaced! They also leave behind no sticky residue, so your timeline cards will always be looking as good as new! That's it! 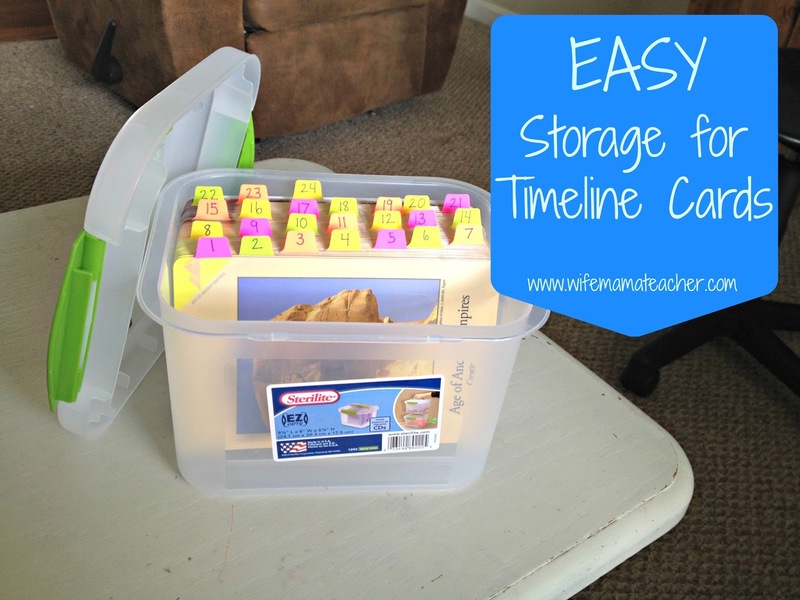 That is all there is to having your very own easy to use, well-organized, and travel-friendly storage system for your timeline cards! I would LOVE to hear what tips you have to help organize your CC and other homeschool supplies-leave me a comment telling me the tips that have been game-changers for you! Want to see what we are up to elsewhere? You can find me on Instagram, Facebook, Pinterest, and also YouTube! *This post may contain affiliate links, and as always, we thank you if you choose to use them. All products shown were purchased by me. Not a sponsored post. I have never accepted money in exchange for a review. Does this organized Facebook Mama have A Blog? Any more CC organizing tips? Hi, Amber! Thank you for stopping by! I checked with her, and she does not have a blog-yet! I will be sure to let you know if she does start one! If you haven't seen it, I do have a post here on my blog that includes a video about how we organize all of our memory work using the workbox system-here is the link! Aren't clear plastic boxes amazing storage solutions. I particularly like using the bigger ones for documents similar to what you're doing with your timeline cards. We LOVE them! I use various sizes for our craft supplies, papers, and so much more! The BEST Classical Conversations Timeline Card Display!